I ran into the grocery store like I owned the place. At nine years old, I was full of life and energy. I was yet to be concerned about boys and makeup and posture. I darted past a row of canned vegetables and headed straight back to the silver swinging door to find my grandfather. He was the popular butcher at our small town IGA in South Carolina. I threw my arms around his thick waist, not to be bothered by his blood stained apron. He immediately put me to work. He handed me a roll of red stickers that boasted “Today’s Special!” and gave me the job of placing them on the poultry lined alongside the refrigerated wall. When I was done, I pretended to be an Alaskan Eskimo living inside the walk in freezers and then later made igloos out of boxes piled high in the nearby storage room. 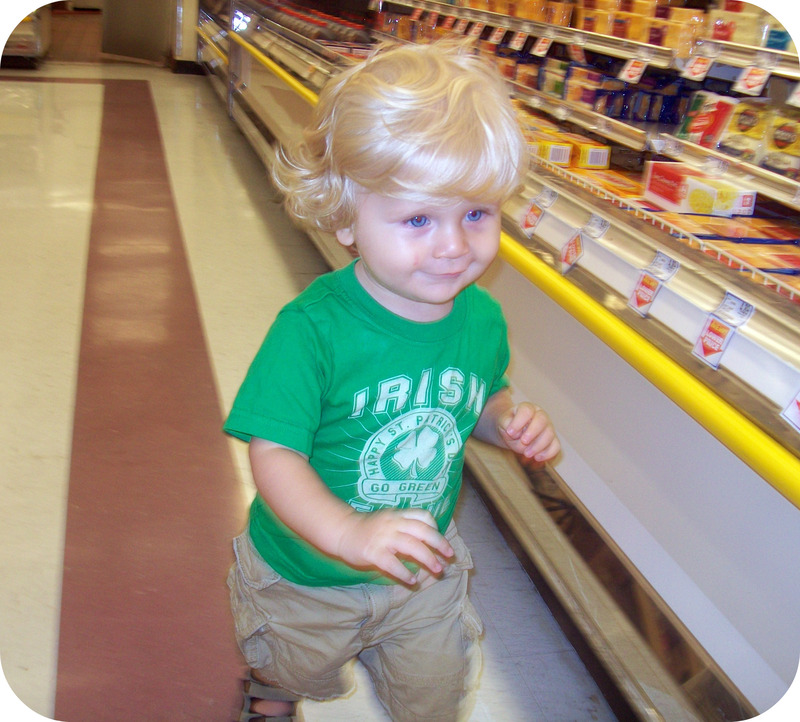 The grocery store was better than any playground in town. As the years passed so did my endearing thoughts of the place where I weekly shop. I prefer getting in and out as quickly as possible. Until recently, with a camera in hand my daughter started snapping away, right in the freezer section. With sour cream on one side and ice cream on the other, we laughed ‘til our cheeks hurt. 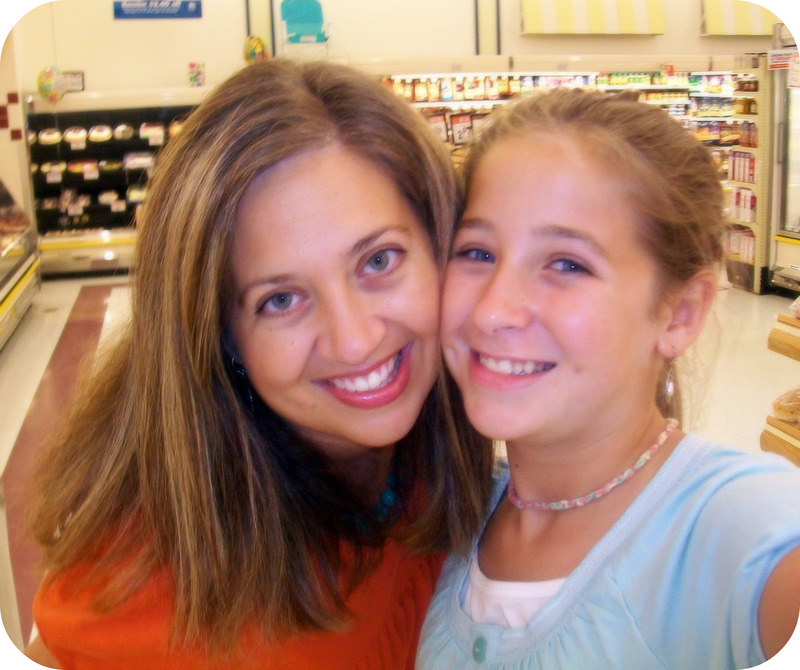 My magical childhood days at the grocery store have come and gone, but it was fun to be a part of hers for an afternoon. those platinum locks are beautiful. so sweet. Memories are special but yet sad because they remind us of how fast time passes by. I can still see you as the little 9 year old girl. In fact I can still see myself as a little guy going to that same butcher with that same bloody apron. Yep, memories are often sad, but I’ m glad I have them. And some of my greatest memories are of you. OH my! This one really brought tears to my eyes. I can still see you running through that grocery store too. The one thing that really stands out in my memory is the big smile that would be on your Papa’s face just to see you coming. He loved you and would be so proud of you today. I was drawn in to your stories; it felt as if I was a customer in the aisle watching it all happen. You are such a talented writer. I wished I would have been more faithful to journal about some of the wonderful memories I had with my children. I’m coming to realize how precious these memories are and how some of the details seem to fade as I get older. Thanks for sharing your memories and your heart; I will certainly be back to visit. Thanks for your sweet words JoAnn. Time does fly, doesn’t it? I hope you and your family are doing well. Please tell them I said hello.